I’m sitting at the bar enjoying sushi and my second $9 cocktail when one of my friends taps the shoulder of the guy sitting next to me. “Have you met my friend, Tee?” she replies, as she turns her back to us to continue conversing with the group behind us, as if she has just accomplished a major task. It’s an awkward introduction. He’s confused and annoyed – mainly, I presume, because dude is already engrossed in a conversation with a young woman on the other side of him. So I’m initially horrified because all my friend has done is inadvertently let him know that I’m possibly 1) a relationship reject; 2) incapable of meeting men on my own; or 3) a homewrecker. Then I grow angry because I’m none of the above, and she’s placed me in a humiliating position all because I’m not flirting and mingling to her satisfaction. I’m left seething in my seat, mumbling under my breath that if I wanted to meet dude, I would’ve introduced mydamnself. Okay, I’m lying about that last part. I’m not that forward when it comes to meeting men. I’m ingrained with that you-don’t-chase-men wisdom and that includes not approaching them to express initial interest. I’m taught to always allow the man to come to me. But according to an informal survey conducted by dating site OkCupid, that way of thinking is so antiquated and doesn’t exactly yield desirable results: “Women who reach out first have a better chance of success.” In fact, those women who initiate contact are 2.5 times more likely to get favorable responses than men who make the first move, and those replies will spark more conversations with men we actually want to talk to. Admittedly, this makes sense. Like many women, I’m generally more selective about whom I entertain or allow in my personal space even in a public setting, so if I actually step to a guy, I must be really intrigued and simultaneously imagining a name change, mortgage, and a set of twins, too. Still my initial thought was in a world where we can now swipe left and right to a relationship, making the first move seems more acceptable and reasonable. But how does the information translate to real life? Will a man find this behavior too aggressive? Emasculating? Desperate? On a recent segment on Good Morning America, writer, author, relationship expert, and BFF-in-my-head Demetria Lucas D’Oyley reminds us that times have changed and first moves on our parts no longer indicate thirst, so there’s no reason why we can’t update our rules, apply them to real life, and take complete charge of our dating lives. I reflect on my dating history just to refute OkCupid’s findings and Lucas-D’Oyley’s statement and support my Grandma’s wise words: “You don’t chase no man.” But I find that I have no grand success story to share. I’m usually one of those women who’s posted up outside of the spotlight enjoying happy hour fare, afterward crossing her arms, avoiding eye contact, delivering a mean blank stare, and daring a soul to interrupt her chill evening. But that’s less about me being standoffish and more about me using past experiences to gauge my present – I’ve had undesirable men follow and stick to me like old honey just from exchanging pleasantries. They come out the woodwork to sniff me out like The Walking Dead extras, and spend the remainder of my evening plotting an escape route. And since I’m an introvert who cringes at the idea of introductions anyway, it’s also more about me preserving my mental energy and small talk for someone who actually piques my curiosity. But even then, I would’ve never stepped to him. I’d unfurrow my brow, relax my tight lips, and hope he gets the hint that it’s okay for him to strike up a convo. Perhaps in that aspect we have gotten it all wrong. 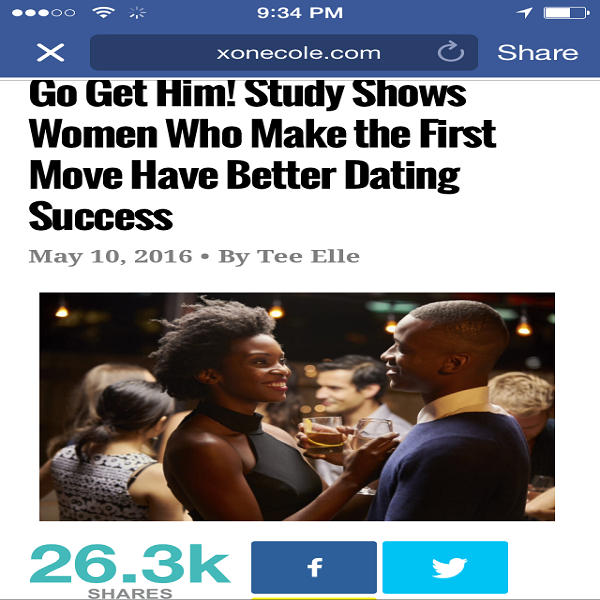 Read the rest on XoNecole.